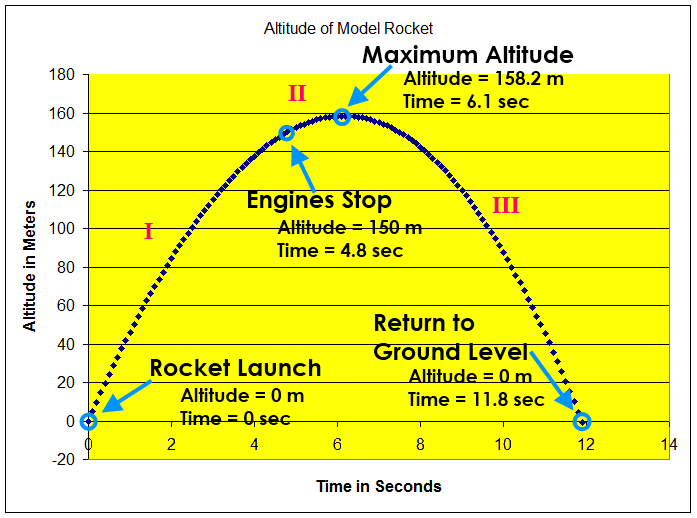 A model rocket is launched straight upward with an initial speed of 50 m/s. It accelerates with a constant upward acceleration of 2.0 m/s² until its engines stop at an altitude of 150 m.
(a) Describe the motion of the rocket after its engines stop. (b) Calculate the maximum height reached by the rocket. (c) How long is the rocket in the air? The rocket continues upward after its engines stop. However, its upward velocity decreases over time until all upward motion stops. At that point the rocket begins to fall back to the earth. This is a quadratic equation. You can solve for t₁ using the quadratic formula. t₁ cannot be two different values. The lower value is the correct answer since the rocket motors stop when the rocket reaches 150 the first time. After t₁ = 4.788575558888 seconds, the acceleration changes to -9.8 m/s² (rather than -7.8 m/s².